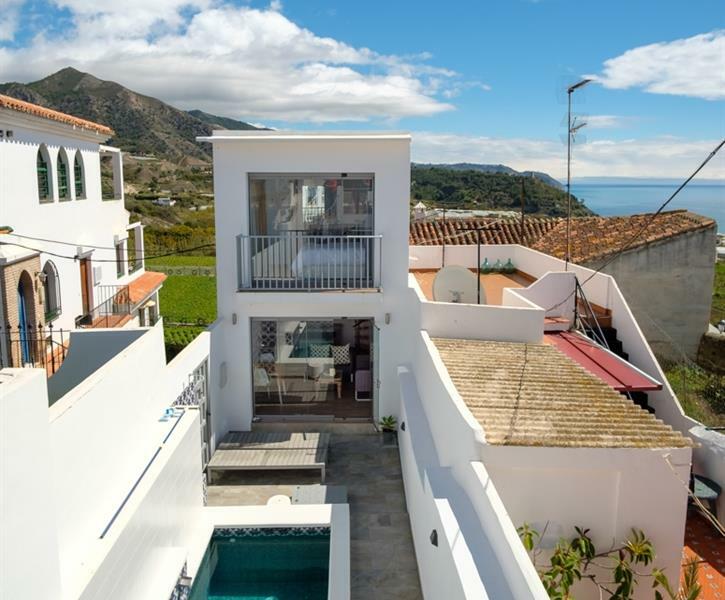 Beautiful architect designed house in Maro, a pretty Andalusian coastal village situated close to Nerja on the Costa del Sol. Vi var meget tilfredse med huset. Billederne snyder ikke! Vi var to par på ferie sammen, og det fungerede godt med at vi kunne have hver vores afdeling. Her var vent og pænt ved ankomst, og lidt mad i køleskabet til at stille den værste sult. Kontakten med ejer fungerede fint. Byen er lille og hyggelig med en fin strand, som ligger 15 minutter gangs fra huset. Restauranter middel standard. Dog vil jeg sige, at det kræver en bil for at komme omkring og teenagebørn vil nok kede sig i Maro. Splashpoolen er ikke egnet til små børn. I stayed at the beautiful home in Maro this summer. It’s stunning with two beds in the main hose and a lovely one bedroom place at the back of the garden. The little pool is just what you need after a day on one of the lovely nearby beaches. Maro is a pretty town and of course Nerja is very close for more restaurants and night life. Love it here! We loved the house and had a very relaxing time in accommodation that was perfect for our family. The house was immaculately presented with quality fixtures and fittings and very comfortable beds. The kitchen is equipped with every utensil needed and it was lovely to find some provisions left for us when we arrived. The pool with water features and mood lighting around the garden was great and plenty big enough for us, although it should be noted that the pool would not be very suitable for small children as very deep. The terrace off the master bedroom was a very nice place to sit. There were beautiful views of the sea and mountains and the surrounding area is peaceful with shops and restaurants close by. We enjoyed the walk down to the beach although it would be a hard walk back in hot weather. We also walked into Nerja but it is a very long walk. We would definitely like to return. A stunning home in the heart of a beautiful and friendly Spanish village, close to numerous amenities. The days were filled with laughter, amazing food, sun and the beautiful Mediterranean. Prepare for complete relaxation and allow the world to slip away... Thank you for sharing your piece of paradise with us.